Best Ride On Toys for Kids Ages 2 to 5 Years Old! What are The Best Ride-on Toys for Kids Ages 2 to 5 Years Old? First of all we all know that small children absolutely LOVE riding toys! But with so many options out there, what are the best ride-on toys for toddlers? I selected here a few of the most popular and most bought riding toys for kids ages 2 to 5 years old by parents! My favorite ones are the electric powered toddler cars! They are amazing and most of them look like real adult cars! 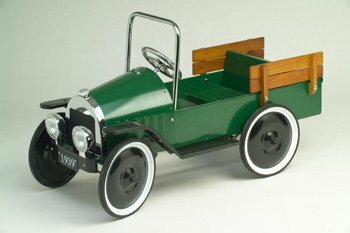 My second favorites are the vintage style metal pedal cars… They are gorgeous! Then comes the cute pedal planes, tricycles and kid scooters! Stick around and see if you are able to find the perfect ride-on toy for your child! Child Electric Car: Best Ride-on Toys for Kids! Kids LOVE driving cute electric motorized cars! 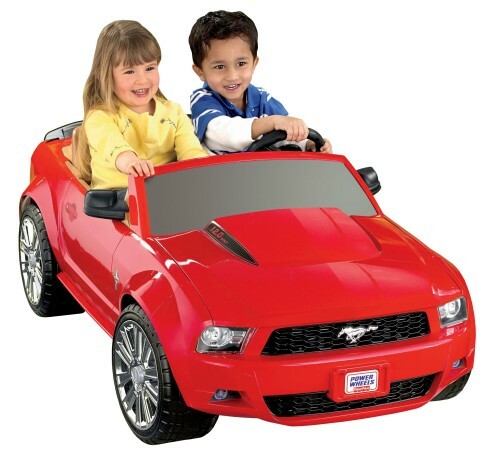 My favorite kid cars are the ones that fits two kids inside, just like this beautiful child Mustang! They love taking turns being the ‘driver’! These electric cars for children usually only go up to 5 mph, so they are pretty safe for them, but still a lot of fun! Watching them learn how to drive their new electric car for the first time is so much fun! Will create lots of beautiful memories for the future! This gorgeous red Mustang for kids comes with the battery and the charger and it also makes engine sounds and it lights up! Will fit kids from 2 until about 5 years old. Check these kids driving their cars! Extremely Popular Riding Toy for Children! 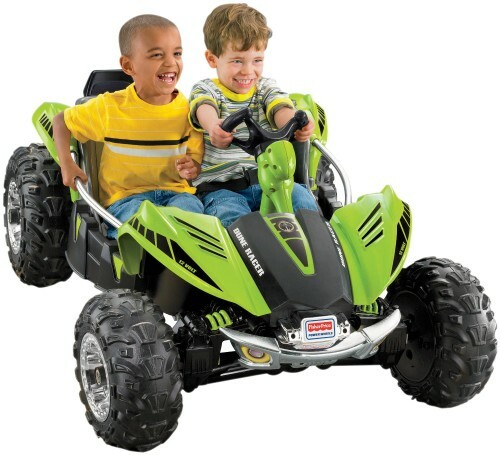 This mighty Power Wheels green dune racer is among the best ride-on toys for boys on the market! It is very popular and it has over 200 good reviews by parents! It also fits two children, which is always a plus and it is ‘tough’! You can also get in PINK, for your adventurous girl! Overall it is affordable, very roomy inside and sturdy. It will take a couple of hours to assemble it. Check out the Dune Racer versus the Mustang! 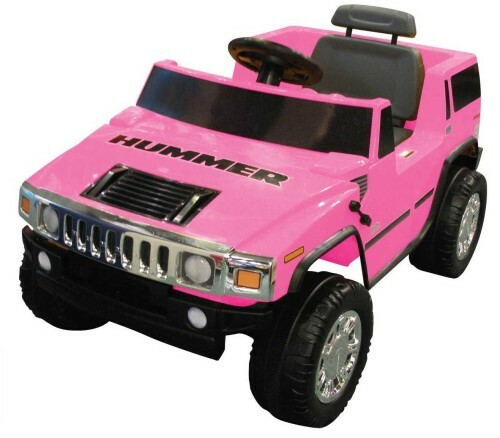 This battery operated pink Hummer for little girls is definitely one of the coolest ride-on cars on the market! It looks very realistic, doesn’t it? Can you imagine your little girl driving this pink Hummer around the block? 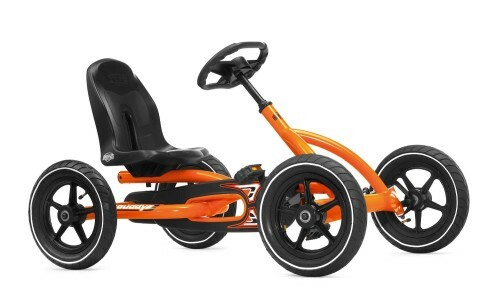 Buddy Pedal Go Kart in Orange: Awesome Ride-on Toy for Kids! This fun pedal go cart is also a great riding toy idea for kids ages 3 and up! It is very big, easy to assemble and very sturdy! It makes an awesome gift idea on any occasion! The seat is adjustable, so it will be with your child for many years! It takes a little practice for the younger kids at first, but when they learn how to pedal, they have a blast! They can also pedal in reverse. The steering is also very smooth and fun! 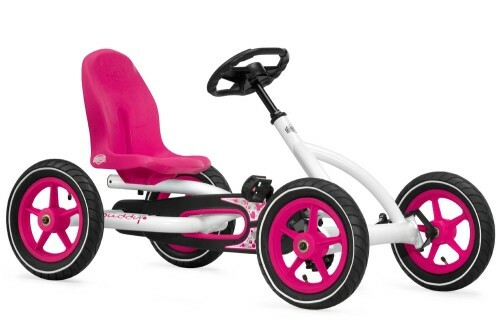 Cute Buddy Pedal Go Kart in Pink and White for Girls! 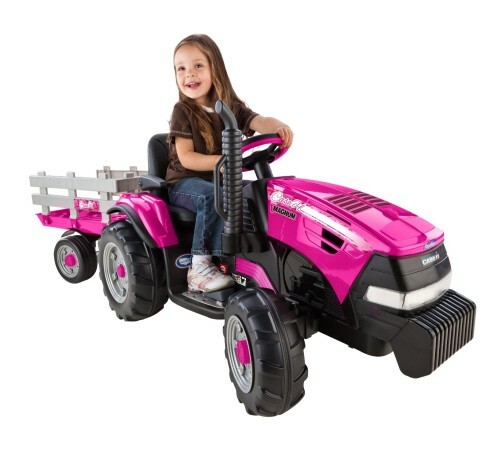 Best Ride-on Toys for Girls! I had to show you this cute pink and white pedal go-kart for little girls! I wish I were small enough to ride one of these now! Parents say it’s very sturdy and well-built! Watch these kids riding their fun pedal go carts together! Classic Riding Toy for Children! In my opinion these classic metal pedal cars will always be among the best ride-on toys for kids! They are absolutely gorgeous, very sturdy, since they are made of steel, and super fun to pedal! This cute green one is one of my favorites! Awesome unique Christmas gift idea! 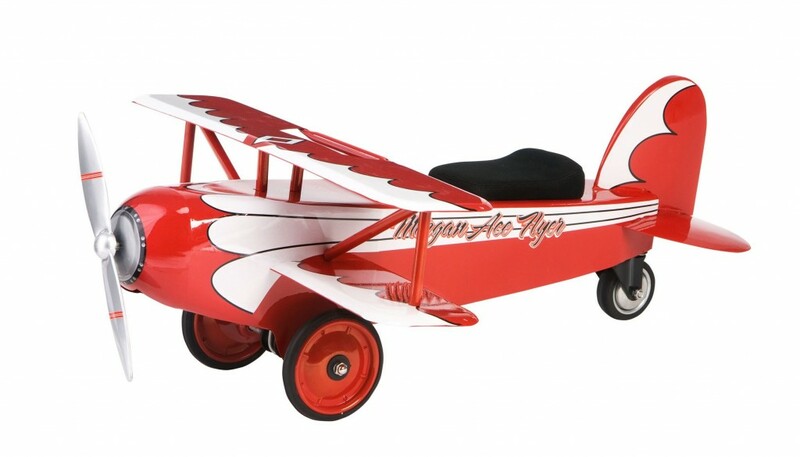 Very Cute Pedal Plane for Toddlers! Pedal planes also make ultra-cool ride-on toy gift ideas for small children! Can you imagine their faces when they see this awesome red pedal plane? It fits kids ages 1 to 3 years old and it is fun!! 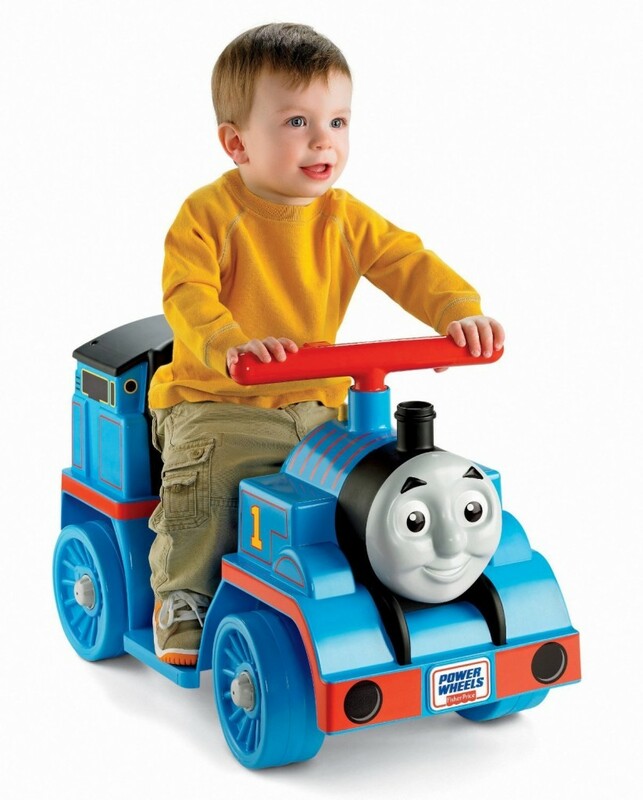 Fisher-Price Power Wheels Thomas The Tank Riding Train for Toddlers! Coolest Riding Toys for Sale! How cool is this adorable Thomas the Tank ride-on train for toddlers? What a fun gift idea it will make! It is perfect for 1, 2 and 3 year old kids! Police Motorcycle: Best Ride-on Toys for Boys! Child motorcycles also make excellent riding gift ideas for kids! 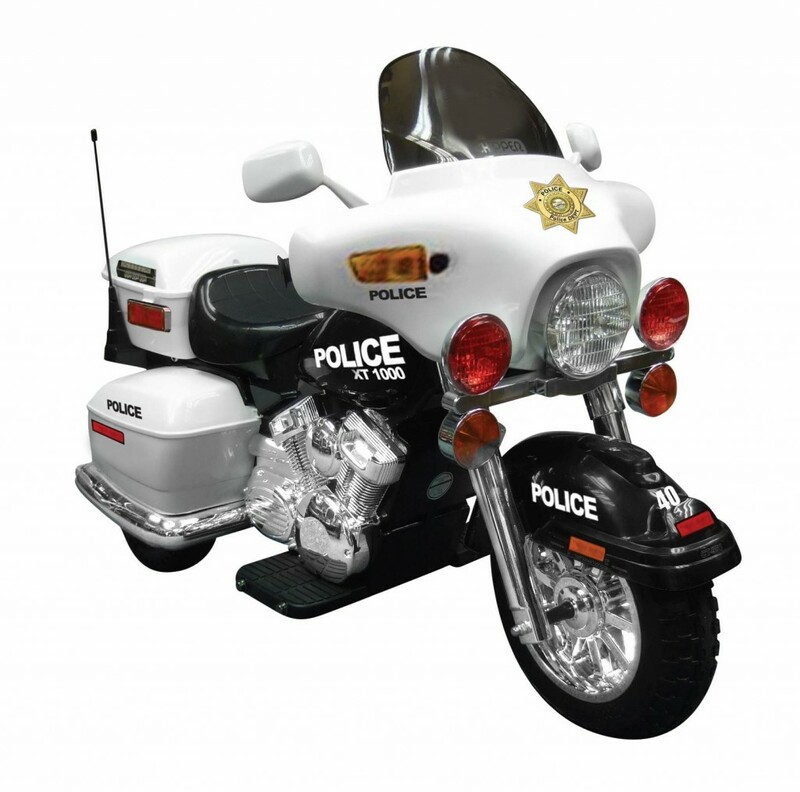 How gorgeous and cool is this police motorcycle for little boys? Doesn’t it look even better than the real police bikes out there? Your little boy is going to go crazy when he sees this cool bike! It is electric powered and it goes up to 5 mph. Great Riding Toy for Small Children! You can’t go wrong by giving a 2 or 3 year old child a cute tricycle! Kids love riding them all over the house and the backyard! They love to go from room to room in their fun tricycles showing off their ‘riding skills’! 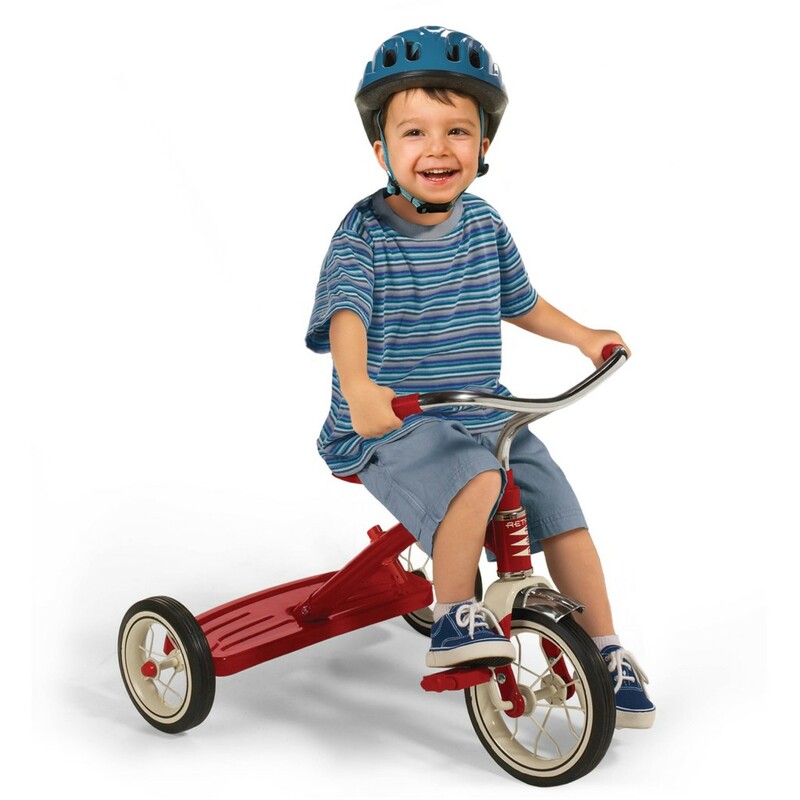 This cute Radio Flyer tricycle is a huge hit among toddlers and small children up to 4 years old! Parents and grandparents say it’s the perfect gift!